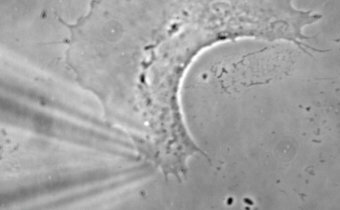 For cells to move in a spe­cific direc­tion they must orga­nize their cytoskele­ton to gen­er­ate a pro­trud­ing front and a retract­ing rear. 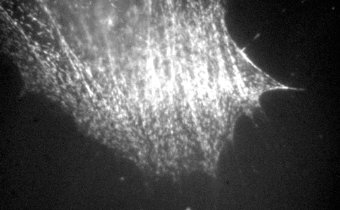 This process of polar­iza­tion requires micro­tubules, which inter­face with the actin cytoskele­ton, at least in part, via the sub­strate adhe­sion machin­ery. 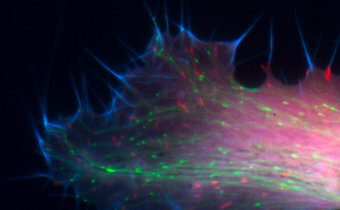 Micro­tubules dis­as­sem­bly leads to the loss of a polar­ized cell form. 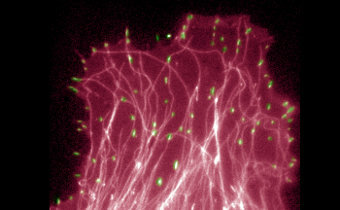 Micro­tubules grow into adhe­sion sites at the cell periph­ery. 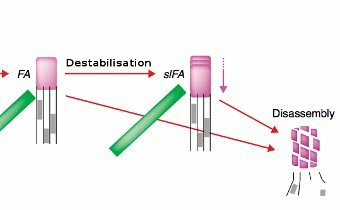 Micro­tubules influ­ence the size and turnover of adhe­sion sites. 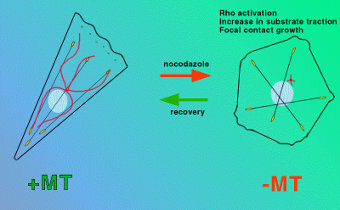 Micro­tubules influ­ence polar­ity by locally inhibit­ing con­trac­til­ity at adhe­sion sites.